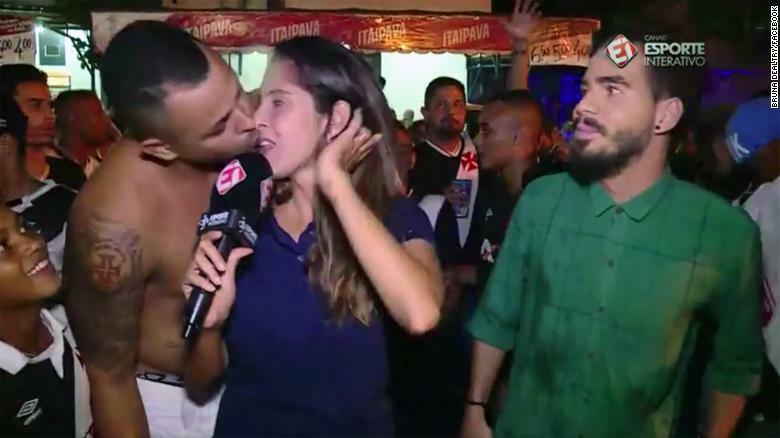 A man gave Bruna Dealtry an unwanted kiss as she was reporting on live television. She and other female sports journalists in Brazil made a video about their experiences with sexual harassment and assault on the job. (CNN) It’s Tuesday night in Rio de Janeiro and Sao Januario stadium is packed with people. The host football club, Vasco, is making its debut in the prestigious Libertadores soccer tournament against visitor Universidad de Chile. That night, Dealtry wrote about the incident on her professional Facebook page, and posted an excerpt of the video. Dealtry’s post generated an immediate response — especially among other female journalist who cover sports. For Ab, the issue went beyond what the journalists face from the fans in the stadium. A veteran sports producer, Ab said she was fired from one of her previous employers after speaking out against a superior who she accused of harassment. Eight women who connected over Dealtry’s Facebook post banded together and formed a messaging group on WhatsApp. Two weeks later, the group had 52 members. They began discussing strategies to take action, and, inspired in part by the #MeToo movement, decided to use social media to spread their message. They agreed to make a one-minute video about their experiences with harassment — many of which had been caught on camera — and the hashtag #deixaelatrabalhar (Portuguese for #LetHerDoHerJob). They published the video on Sunday, March 25; since then, local media reported that it’s been viewed millions of times across different platforms, citing the social media data aggregator CrowdTangle. Interspersed with clips of harassment and assault — including Dealtry’s unwanted kiss — the women speak to the camera about their experiences, demanding respect and saying they’ve had enough. Vasco, the team Dealtry was covering the night a fan kissed her, was among those who shared the video, along with Brazilian character artist Renato Peters and soccer legend Zico. Siqueira said the Whatsapp group has now grown to nearly 100 women, who work in sports journalism all over Brazil. The women have received messages of support from people all over the world and hope to broaden the campaign to include international journalists as well. Siqueira said the group has no definite plans for a follow-up to the video, but they are discussing their next steps. Nearly a week after the women posted their video, Brazil’s Sports Ministry and the National Secretariat for Women’s Policies launched a campaign featuring female athletes speaking out against sexual harassment in sport and denouncing it as a crime. It also included a call for action for women to report the incidents to an emergency hotline.